Making | How can I recycle this? Upcycling clothing: what can I reuse, recycle or upcycle to make underwear? I’ve got some pretty printed slightly-stretchy cotton vest tops that have either lost their shape or don’t fit any more because they’ve done that thing where they mysteriously shrink by four inches in the wash. As I still like the patterns, I’d like to reuse them in some way and underwear seems a fun thing to try: the patterns would work well on pants and I think I could get at least one pair of boy-short knickers from each vest top. Has anyone made their own underwear from old tops or t-shirts? And favourite how-to recommendations or hints/tips? What about making underwear by upcycling other items of clothing? Does anything else lend to easy conversion? What about upcycling things to make stuff other than knickers/shorts? Socks? Bras? Winter warming layers? 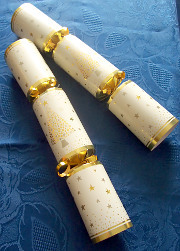 What can I reuse or recycle to make Christmas crackers? So… Christmas crackers. In one of the many, many newspaper articles about having a frugal Christmas during the New Austerity Age, I read that making Christmas crackers is a false economy – because it often costs more to make them at home than you can buy them for in the shops. But money isn’t everything – homemade ones can be a lot lower waste – using up household rubbish and can contain actually useful (or delicious) prizes rather than bits of plastic tat. There are many tutorials online for making basic crackers out of toilet rolls tubes and squares of Christmas wrapping paper (with purpose-bought crackers snaps for that bit of bang) but I wondered if anyone had any ideas for making them more interesting or creative. Is it possible to make reusable Christmas crackers? The body refillable each year? And does anyone make their own paper hats to go inside them? 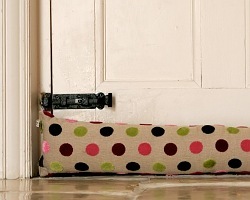 What can I reuse or recycle to make a draft excluder? Ok, put your hand up if you’re cold. I’m guessing everyone in the northern hemisphere is waving at their computers right now. It’s pretty brr. On my frugal/cooking/growing blog The Really Good Life, I’ve written about the five frugal ways I’ll be keeping warm this winter – but one thing I missed off is the list is draught excluders (aka draft dodgers). I used to have a black fun fur one – which matched our black real fur cats – but it was in the days when the cats were more territorial … and amorous. I’ll let you finish that lovely story yourself. Last year, after we’d just moved into our new house, there were so many draughts and bits of bad insulation that draft excluders seemed pointless so I didn’t bother. This year though, game on! So what have you made them from? 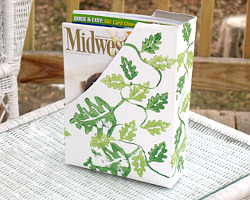 Recycle This regular BookstoreBabe made some from her daughter’s old heavy patterned tights and rag-bag stuffing – but warned that they stretch! I’ve also heard of people making them from old woolly jumper sleeves or trouser legs – just sew up the ends and stuff. I imagine the duvets from the other day would do the job too without any sewing or cutting need – just tied into a roll. And don’t forget, it’s not won’t be sitting on it, so it doesn’t need to be stuffed with soft filling like a cushion or pillow – you can use newspaper, carrier bags or stuff like polystyrene foam peanuts — anything to provide a bit of bulk. Have you made your own? What did you use? Send pics/links if you’ve got them! What can I reuse or recycle to make Advent calendars? Advent started yesterday so really I should have asked this question last week but nevermind. We don’t celebrate Christmas but I know that one or two people around the world do – and some of those people have Advent calendars to open on the run up to the 25th. When I was a kid, I’m pretty sure my mum gave us the same calendar several years running, with the doors closed neatly back into place – it didn’t matter because the joy of opening the door to see what was behind it was enough. 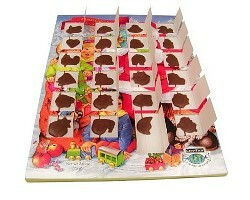 Then when I was my early teens in the early 1990s, chocolate advent calendars suddenly became cheap and wide available, the chocolate rather than the drawing of the bell or the reindeer became the goal and the calendar was suddenly disposable. But it doesn’t have to be that way! There are some great examples of creative – and reusable – advent calendars out there – such as the this spool advent calendar kit from Cathe Holden of Just Something I Made – I imagine something similar could be made by recycling any sort of plastic tubing or even decorated toilet roll tubes if you haven’t got 24 cotton spools to hand. I love the idea of having treasure hunt elements to the messages or having Christmas preparation activities to-dos – or they could be silly jokes to get everyone warmed up for their Christmas crackers. I’ve also seen some examples where people have gathered together 24 boxes – they could be old packaging painted or covered in paper as well as numbered – and stuck them together to make a countdown calendar with plenty of storage. They wouldn’t have to be filled with treats or gifts – tree decorations would work well – many kids would love to decorate the tree an item at a time as each item is revealed. And weekend days could be filled with craft supplies that they have to make into a tree decoration. And it’s not strictly recycled but I also love the reusability of Attic 24 Lucy’s advent garland – it could be recycled if you used reclaimed yarn or upcycled fabric to make sewn stars instead of crochet). Have you made an advert calendar by reusing or recycling anything? Or have you seen any more great examples out and about on the web?